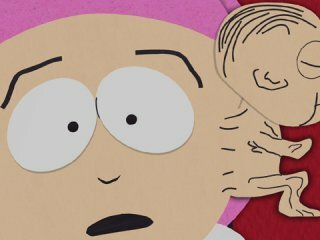 South Park Episode 205 - "Conjoined Fetus Lady"
Kyle is injured and must go to see the school nurse and is terrified because of the stories he's heard. She looks fairly normal, except for the dead fetus sticking out of her head. Kyle's mother educates the boys on her "condition" and decides that everyone in South Park should be made aware. Meanwhile, the South Park Cows dodgeball team goes to the state, national and finally the international finals in China.